A complete standalone craftable set of Dynasty Armor, with shield and helmet. * Added light armor version. * Added placeholder models for males; will eventually add something more suitable. * Armor added in previous version will have disappeared. See 'known issues' for more details. This is simply my own variation of that 'Dynasty' armor set thats been all over Nexus. Adds Dynasty Armor, Boots, Crown, Gauntlets & Shield to the smithing forge, and for sale at Belethor's in Whiterun (does not replace any other armor models; this is a stand-alone armor set). This armor set comes in two varieties; Heavy & Light. This armor set requires the steel smithing perk to create, has material requirements similar to steel but requires ebony or malachite instead of iron ingots, can be improved at the armor bench using ebony or malachite, gives protection equivalent to ebony or glass armor, and counts as steel plate / scaled for the purposes of armor set perks. * The main armor, boots and gauntlets work for females only. Males use Steel Plate as placeholders for these models. 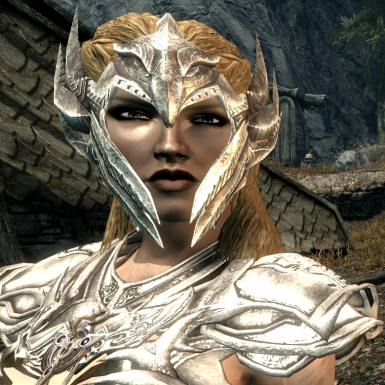 * The helmet does not work with Khajiit or Argonians, instead they see a circlet. * If you were using armor made with a previous version, you may have noticed that the armor has disappeared. This is an unavoidable consequence of changes I had to make to the .esp file, since it had troubles being read by the CK; as a result the item IDs for the previous armor were changed, meaning that the armor associated with those IDs no longer exists. You can always make or purchase a new set, however if you feel cheated by losing the previous set, there are console commands you can use to give yourself a new set for free, minus any enchantments or smithing improvements. Open the console with the "~" key, then type "help dynasty" to get a list of the item IDs, then type "player.additem (itemID) 1" for each item ID; do not type the " marks or brackets. * Armor is now more reflective. * Crown & shield textures updated. * Now in BSA archive format; be sure to delete "data\meshes\armor\dynasty" & "data\textures\armor\dynasty" directories if you had 1.0 installed.